Baseball, America’s favorite sport and one of the most popular sports in the world always bring high stakes and top-notch entertainment. The sport has produced icons such as William Mays, Barry Bonds, Derek Jeter, Ichiro Suzuki, Hideo Nomo, Alex Rodriguez, and Babe Ruth, to name a few. The sport’s nearly 200-year history has not only seen the best coming from the USA, but Asia as well. The continent has also produced world-class talents such as Suzuki and Nomo. Suzuki is the baseball equivalent of Yao Ming, a player from another culture who completely changed the game with immense talent and skill. Ticket designs have grown to be very popular over the years. They are no longer merely used in raffles, cinemas, and music and sports events. Graphic designers have taken advantage of their popularity and used them as designs for party invitations, too. Baseball tickets are not exempted, as the sport is one of the most watched in the world. 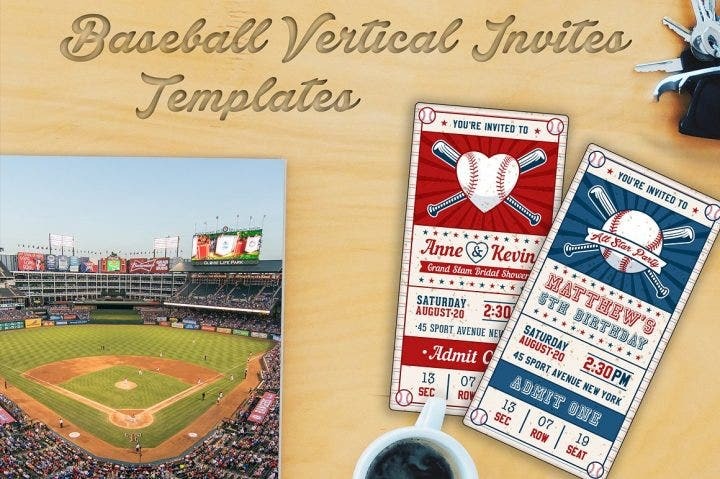 Take a look at these awesome baseball ticket templates and use it for your event. Batter up! 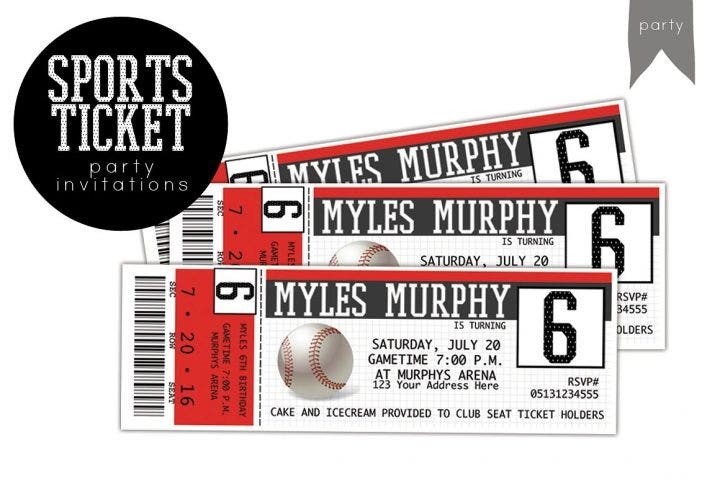 This baseball ticket birthday party invitation uses some varsity style fonts while using an image of a baseball and two bats crossed together. A baseball to represent a baby boy or a bow to represent a baby girl provides the central attraction of this gender reveal ticket style card. Different images are used to represent each gender, making this ticket template very unique and attractive. This baseball ticket birthday card template uses vintage fonts highlighted in a bright red on stained paper background. This vintage baseball sports ticket birthday invitation also uses a stained paper background and varsity style fonts. A red and blue color combination is utilized to add visual appeal. Weddings and sports—they don’t usually mesh together well, but sports designs are starting to be integrated in different kinds of events. This vintage baseball wedding card has a very unique concept for a wedding invitation and uses a ribbon as the heading image with two baseball bats crossed together in the background. This beautiful orange baseball ticket party template is one of the best baseball ticket templates around. Various elements are used in the text, making it more attractive. An image of a baseball cap with bats crossed together is also incorporated in a bright orange-colored background. Sometimes, the best and only image to use in a baseball ticket template is the actual baseball itself. This template uses an image of a large baseball placed at the center of the template. The event details are spread across the design with red-colored borders also being used to add color to the template. 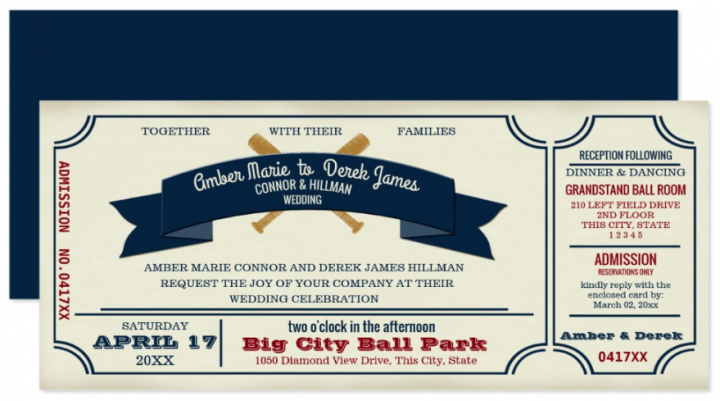 This baseball ticket party invitation collection has two available designs, one for a kid’s party and one for a bridal shower. Both designs have sporty yet attractive looks that manage to perfectly blend colors and images. 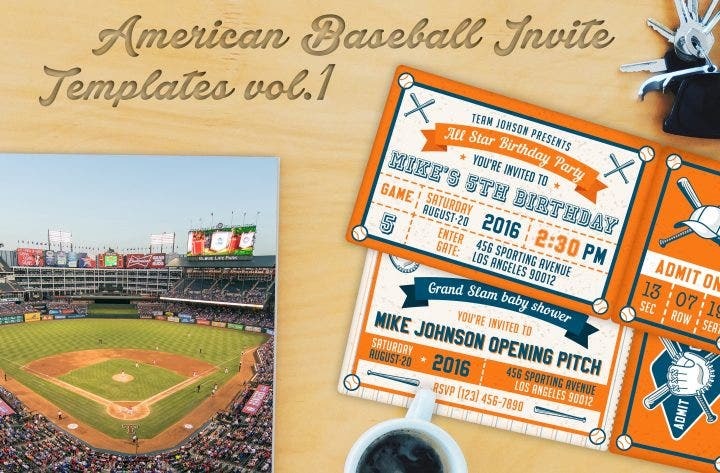 Similar to the other baseball ticket party invitation template collection, this collection also contains two designs (kid’s party and bridal shower). A white background is used for the templates, but it doesn’t take away the visual attraction of both designs as blue and red colors are used for all the text. Similar to the Major League Baseball (MLB) logo, this baseball camp invitation template uses a silhouette of a baseball player about to hit an incoming fast ball. The silhouette is the central image of this template and the template itself uses wonderful font styles and colors. Two colors are available for this design: red and blue. Sports events are always enjoyable activities. 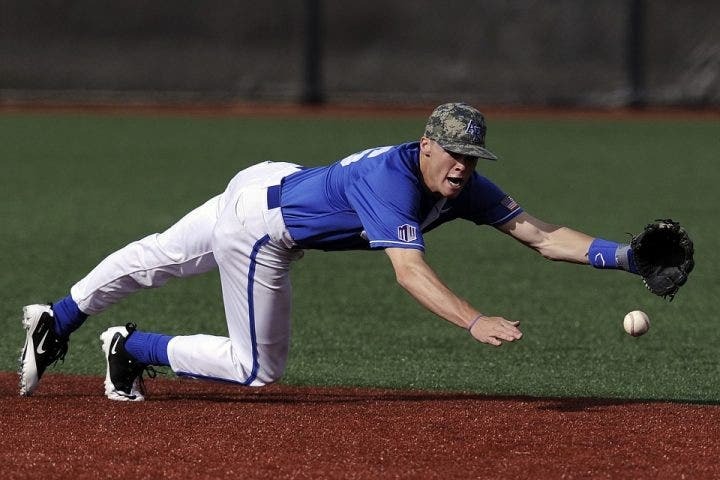 Baseball is no different as it pits two teams against each other in a battle of talent and strategy. 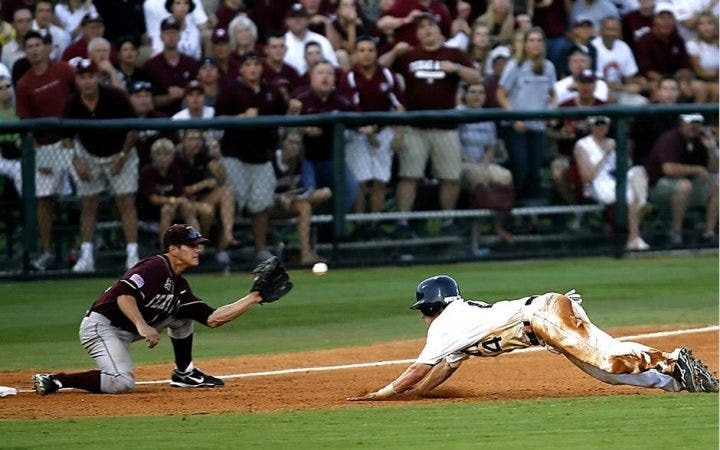 Similar to other sports where games can be decided in the last minute or the last play, baseball also has its share of thrilling and nerve-racking moments. For fans, it can either be a moment of jubilation where you celebrate the game’s result with friends in a bar or club, or pure heartbreak where you just want to go home and cry yourself to sleep. Some of baseball’s greatest ever games include the dramatic game 7 win by the Chicago Cubs against the Cleveland Indians in the 2016 World Series, ending their 108-year championship drought, and the amazing game 7 comeback by the St. Louis Cardinals against the Texas Rangers in the 2011 World Series. 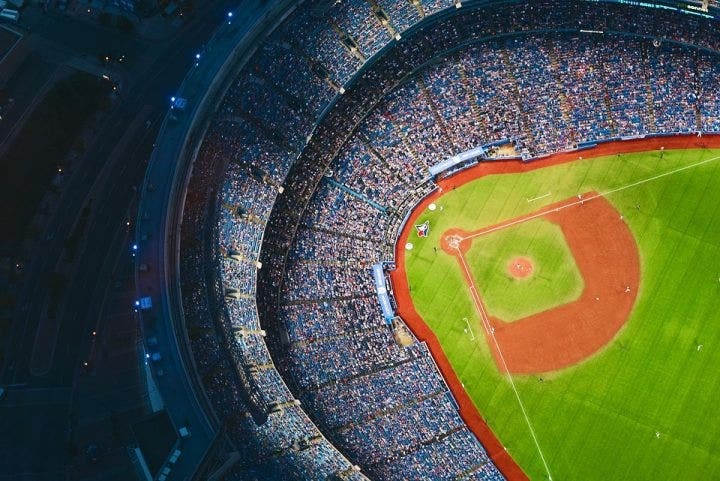 If you have managed to watch a number of baseball games on television, especially MLB matches, you may have noticed baseball is not only associated with the actual game itself. Similar to soccer, which is associated with crazy and passionate fans with the logo of their favorite teams painted on their faces, baseball is associated with a number of things. Hotdog sandwiches and beer have been staples in baseball stadiums, and the food and drink’s popularity have also contributed to the popularity of the sport. Baseball tickets are very popular themselves. Tickets provide a glimpse of the two competing teams and get fans excited about the possibilities that may transpire in the game. Usually, the tickets feature the logos or the best players of the competing teams. Other times, a photo of the home team’s stadium is shown in the ticket. No matter what the design is, baseball tickets tend to be very attractive to the ticket holder. Additionally, baseball tickets can also be kept as souvenirs. There are numerous events where you can take advantage of the use of baseball ticket designs, and there is definitely no limit to what event/s they can be used. Here are some suggested tips on where baseball ticket designs can be used best. This is probably the most obvious and most appropriate event where baseball tickets can be used. If the costs of tickets watching a live baseball game are too expensive, host a baseball viewing party in your home instead and make some replica baseball tickets for your guests. Even if the game is still months away and you’ve already given out the tickets, excitement will already start to build up once they receive the tickets. Sports events are more fun if they are watched with family or friends despite the venue. Watching the said events with loved ones becomes more meaningful especially during tournaments and championship games. Again, sports-themed designs are best used for sports events. Sports conferences, which are held by sports governing bodies to discuss plans to host tournaments and competitions as well as any issues regarding in-game regulations, can be good avenues to use sports ticket designs. If the conference covers multiple sports including baseball, then use a combination of vector images directly related to the sports themselves (like balls, nets, rims, goal posts, etc.). You can also create a collage by incorporating high-resolution photos of athletes playing in-game. The better the images used, the better the overall design will look and appeal to the ticket recipients. 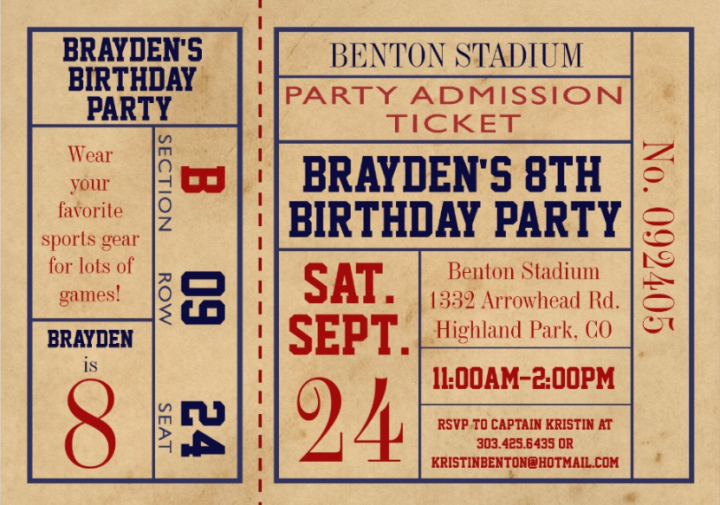 Baseball ticket designs can also be used for birthday party invitations. 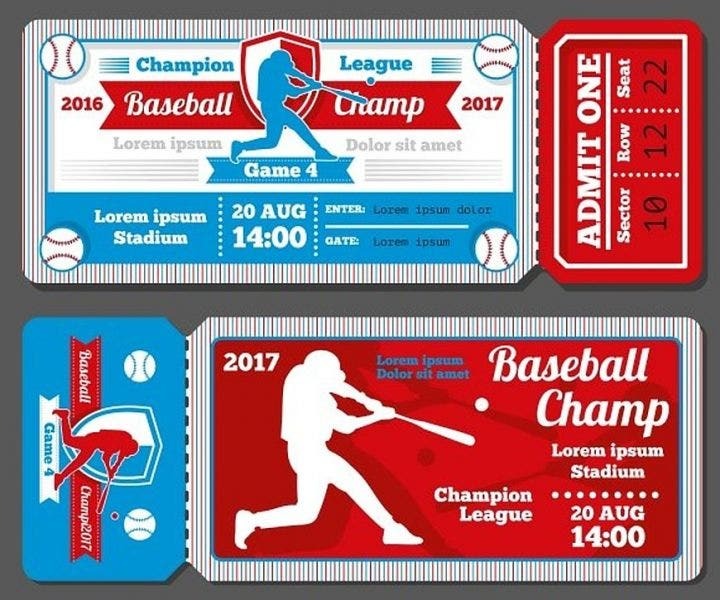 If your kid loves to play baseball or you are just looking for a unique theme or concept to use, definitely use baseball ticket designs. 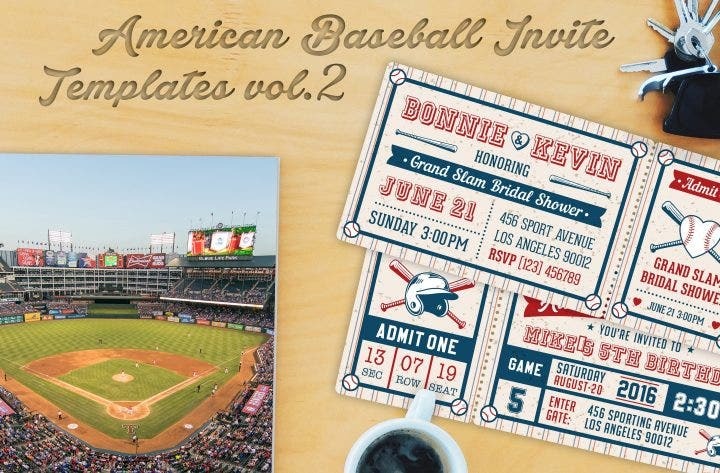 The designs for these invitations can vary, from inserting images of a baseball helmet or baseball bat, to adding silhouettes of athletes playing the game, or even using the MLB logo and inserting it in the invitation. Don’t worry, you won’t be charged for copyright infringement unless you sell the design. 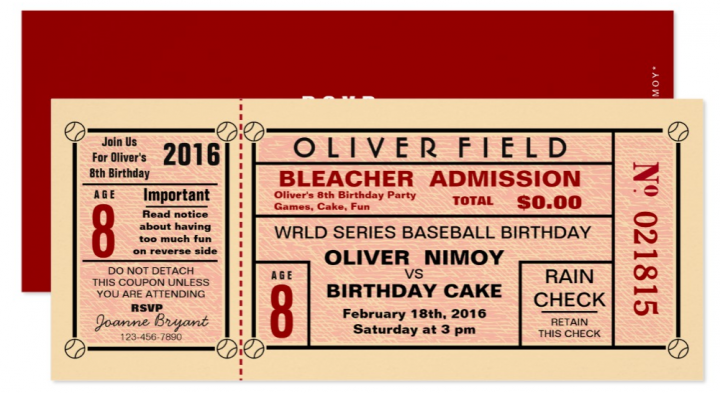 Baseball ticket themed party invitations are great concepts to use if the birthday celebrant is an aspiring athlete. 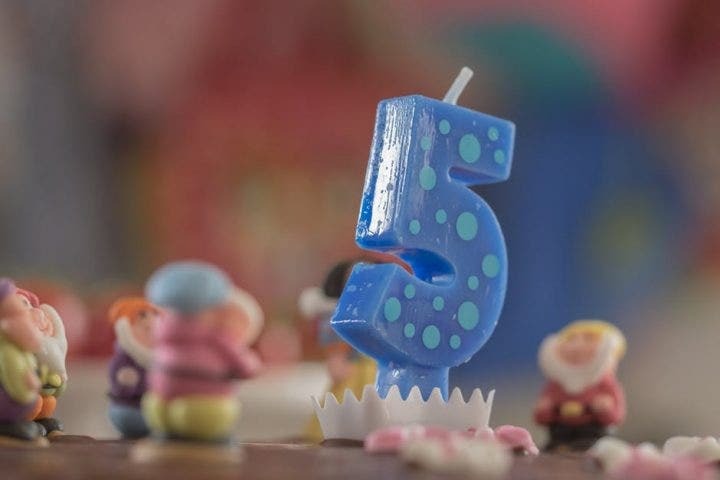 This also diverts from the usual invitation designs revolving around comic book and television cartoon characters. Expectant fathers don’t have problems using sports-themed designs. They may actually prefer it, especially if the baby’s gender is male. The issue will be convincing the mother to agree with the idea. If she ever decides to go along, the expectant father is in luck. For baseball ticket baby shower invitations, stick to child-friendly images relating to baseball. Although images of athletes competing in-game is one of the best concepts to use, they are too intense and will not fit the purpose of the baby shower. Images for baseball equipment such as the helmet, bat, gloves, and ball can still be used but lighter colors such as pink or yellow are preferred when adding color in these said images. This is another avenue where baseball ticket designs can be easily used. Sports bars broadcast live telecasts of popular sports events. 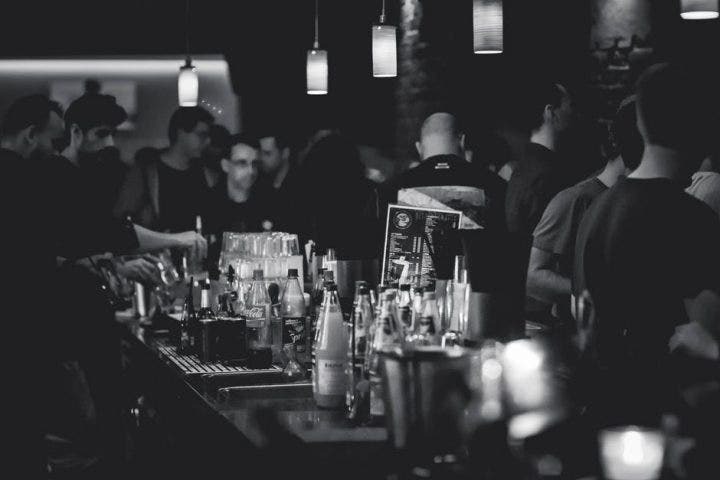 Customers don’t pay for watching the event, but instead they pay for an entrance fee which usually is consumable with the bar’s foods and drinks. Baseball ticket designs can easily be integrated in the bar’s menu. The designs can revolve around having a collage of mini-baseball tickets paired with photos of famous baseball athletes. Since sports bars are more concerned with the customers coming in to watch popular sports events over tasting their dishes, then emphasis on sports must be prioritized over anything else. There is no limit on how baseball designs can be accomplished. In actuality, the more sports-related designs which are incorporated, the more it looks attractive. Baseball ticket designs will continue to be popular as the game continues to extend its reach worldwide. Now get ready to step on that plate and watch for that curve ball!